Every 17 seconds, someone in the United States is diagnosed with diabetes, according to the American Diabetes Association. More than 26 million Americans have diabetes, and about 90% of cases are type 2. 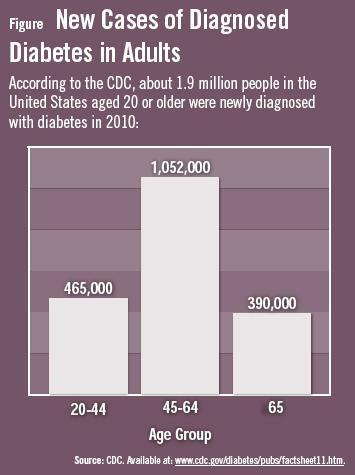 Data from the CDC estimate that 1.9 million Americans were diagnosed with diabetes in 2010 (Figure). Many patients who are newly diagnosed with diabetes may be distressed after receiving the news. They may fear the worst about the treatments and lifestyle changes that lie ahead. Others may choose to ignore the disease or fail to grasp the severity of the situation. They may leave their doctor’s office with a poor understanding of what is required of them to get their diabetes under control so they can avoid serious complications, such as heart attack, stroke, kidney disease, blindness, amputation, and even death. “It can be challenging for healthcare providers to get patients to understand the seriousness of their disease at the time of diagnosis,” says Vivian A. Fonseca, MD. Healthcare providers play a vital role in clearing up any confusion patients may have about their diagnosis. However, it can be difficult to inform patients about all the key components of managing their disease. Prescription drugs and lifestyle changes are required. Informing patients about why they need specific treatments is important, but key messages can be lost because of the psychological impact of being newly diagnosed. 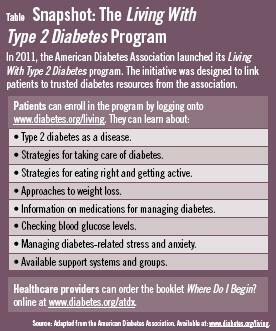 The American Diabetes Association recently launched the Living With Type 2 Diabetes program (Table). Its purpose is to provide newly diagnosed patients with the right information and tools at the right time to help them manage their disease and improve their lives. The program was designed by public health experts, physicians, certified diabetes educators, nurse practitioners, and registered dietitians and was reviewed by people living with type 2 diabetes. It is specifically designed to start answering patients’ questions on the day of diagnosis without overwhelming them. Patients can enroll online or by phone. The program is free of charge for patients, available in English or Spanish, and healthcare providers can order the booklet online. Healthcare providers can order the booklet online at http://www.diabetes.org/atdx. For more information on the American Diabetes Association’s “Living With Type 2 Diabetes” program, go to www.diabetes.org/living. Or go to http://www.acpinternist.org/supplements/ada_april.pdf. CDC. 2011 National Diabetes Fact Sheet. Available at: http://www.cdc.gov/diabetes/pubs/factsheet11.htm. American Diabetes Association. Standards of Medical Care in Diabetes—2011. Diabetes Care. 2011;34:S11-S61. Available at: http://care.diabetesjournals.org/content/34/Supplement_1/S11.full. PreviousAnesthesiology 2012: Are Immediate and Long-Term Pain After a Motor Vehicle Collision Hereditary? Vivian A. Fonseca, MD, has indicated to Physician’s Weekly that he has received research support (for Tulane University) in the form of grants from Novo Nordisk, sanofi-aventis, Eli Lilly, Daiichi Sankyo, Pamlabs, Reata, and Halozyme. He has also received honoraria for consulting and lectures from GlaxoSmithKline, Takeda, Novo Nordisk, sanofi-aventis, Eli Lilly, Daiichi Sankyo, Pamlabs, Xoma, and AstraZeneca.